Humanium Metal is an initiative of IM (Individuell Människohjälp) where seized illegal weapons are melted down and the metal is made available for commercial production. In a collection made by the Non-Violence Project, the world famous sculpture is now presented in a limited edition made of Humanium Metal. The sculpture is a classical tribute to non-violence and peace, and through the cooperation adds an extra symbolic dimension. Carl Fredrik Reuterswärd belongs to the group of successful Swedish artists. He has a strong and solid anchoring in the international art world and has an extensive representation in both public and private collections, including Moderna Museet in Stockholm, Malmö Art Museum Malmö, Sprengel Museum Hannover. Besides, he is also represented at Nationalmuseum Stockholm, the Museum of Modern Art New York, Centre Pompidou Paris and several other collections. John Lennon was murdered outside his home in New York, in 1980. The whole world was upset and mourned the pop idol, whom so meaninglessly had been affected by the violence. 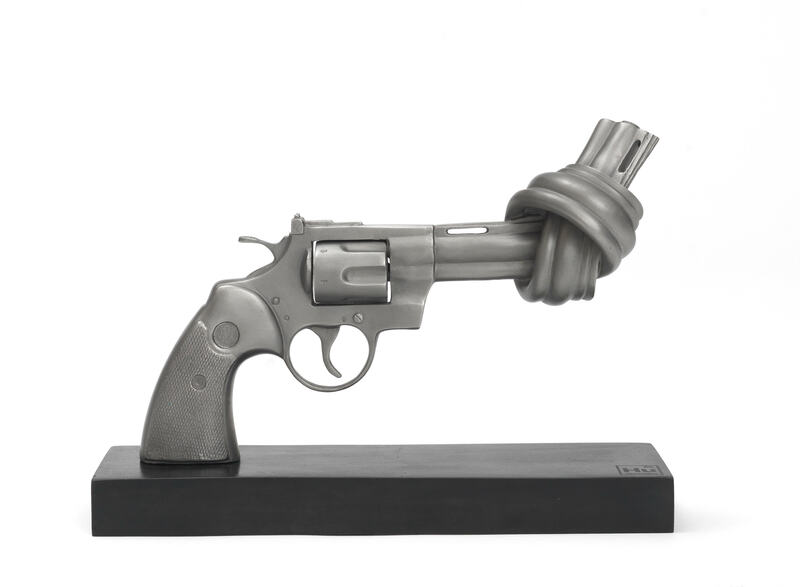 Carl Fredrik Reuterswärd was deeply taken and, both as a tribute to John Lennon and as a protest against violence, he created this, his most iconic work – “Non-Violence”. 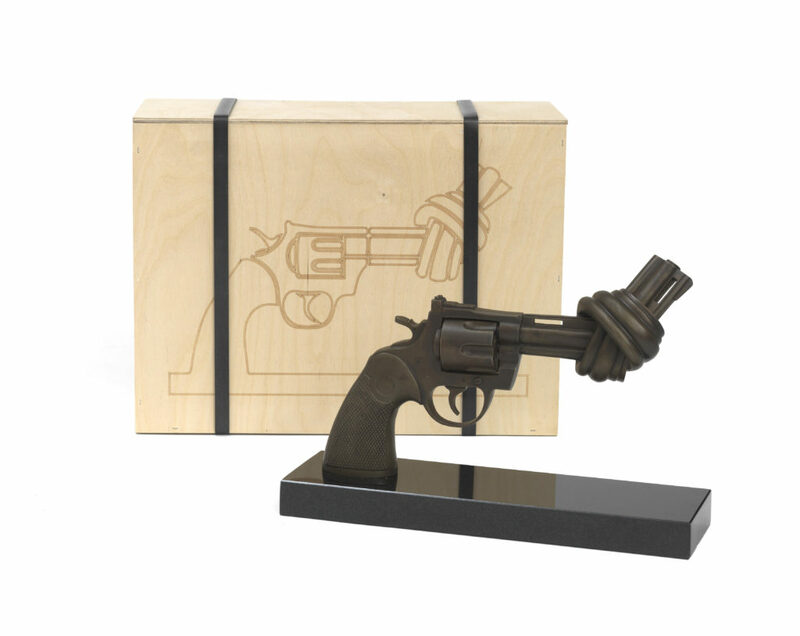 It is a sculpture in bronze, symbolizing a Colt Python 357 Magnum revolver, which pipe points upwards and has a knot. In a direct and uncompromisingly manner he managed to turn an object, traditionally used for attack, defence and protection, into a symbol with a universal and clear message of non-violence and peace. In 1988, the sculpture was placed outside the UN-building in New York. Ever since, many cities around the world have “Non-Violence” in different designs as an important peace symbol in the urban environment. “Non-Violence” is an important and up-to-date work which, through its prominent location, hopefully can achieve that the world-community and humankind never forget the goal of creating peace on earth. For more information about the Non-Violence Project, go to www.nonviolence.com. You pay by credit card or by invoice. Shipment is made from Sweden by DHL and is free. Please be aware that you may be liable to pay customs and sales tax to import the good(s) to the US. Any customs or import duties are charged once the parcel reaches the U.S. These charges must be paid by the recipient of the parcel. If you order now you will be by the first to receive the sculpture in December. You pay by credit card or by invoice. Shipment is made from Sweden by DHL and is free. Please be aware that you may be liable to pay customs and sales tax to import the good(s) to the US. Any customs or import duties are charged once the parcel reaches the U.S. These charges must be paid by the recipient of the parcel.